This is a great book for anyone who enjoys a good love story—and for anyone who is fascinated by C. S. Lewis. 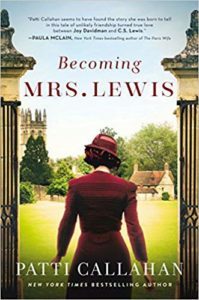 Becoming Mrs. Lewis: The Improbable Love Story of Joy Davidman and C. S. Lewis is full of the real-life details and writings of C. S. Lewis and his wife and published author Joy Davidman. The book introduces two strangers, both independently seeking and growing in faith and in curiosity, who become pen pals, then cherished friends, and then fall deeply in love. Patti Callahan Henry has clearly done her research on the characters and put a lot of thought into this book in order to weave their documented words – their poetry, essays, and speeches – together to illustrate their relationship. The author also demonstrates the idea that behind many great figures, there is often another overlooked figure who has helped to shape and grow the other so that they can have the kind of impact that Lewis did. This entry was posted in Natalie and tagged fiction, historical fiction on February 11, 2019 by ipplstaffblog.